Allergen Information: Contains Soya Bean, Wheat. 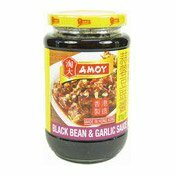 Ingredients: Soy Sauce (Water, Soya Bean, Salt, Wheat Flour), Garlic (21%), Fermented Salted Black Bean (19%) (Black Bean (Soya Bean), Water, Salt), Sugar, Water, Rapeseed Oil, Salt, Rice Wine (Water, Rice), Modified Maize Starch, Yeast Extract, Colour (E150c). Simply enter your details below and we will send you an e-mail when “Black Bean & Garlic Sauce (淘大蒜蓉豆豉醬)” is back in stock!